Papers: Correspondence in Abraham Robinson Johnston papers, 1834-1849. Papers: 59 items. Chiefly family papers. Also discussed in Fitch family papers, 1812-1936 (bulk 1812-1861); and Jonathan Rider Cady miscellaneous manuscripts, 1802-1918 (bulk 1802-1842). 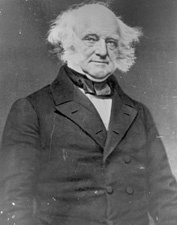 Papers: 41 letters from Van Buren in Azariah Flagg papers, 1824-1866, on 1 microfilm reel; correspondence in Hamilton family papers, 1768-1930; and in Renwick family papers, 1794-1916. Papers: 8 items (1830-1859) in various collections; and correspondence in Stearns family papers, 1785-1918. Papers: Correspondence in Ralph Haskins papers, 1800-1850. Papers: Miscellaneous letters and references in various collections. Papers: Discussed in Jonathan Roberts memoir, A Fathers recollection addressed to his children as a legacy transmissible to his descendants in future time, 1799-1830; correspondence in Joel Roberts Poinsett papers, 1785-1851; and letters (1836-1862) from Van Buren in Gilpin family papers; and Ogden D. Wilkinson collection, 1684-1856. Papers: 2 letters (April 5, 1853; no date) in Bookfellow Foundation autograph collection, 1793-1945; and 1 letter (November 29, 1851) in Sang autograph collection, 1751-1954. Papers: 1787-1868. 17 containers. Letters received and drafts of letters sent, primarily concerning state and national politics, banking, and economic issues; notes on legal cases, law topics, and speeches; statements of accounts, agreements, bonds, and court briefs; state papers such as government acts, reports, and treaties; and manuscript of his autobiography. Available on 35 microfilm reels. Also papers, 1799-1861. 5 containers. Finding aid. Additional Papers: Correspondence in Commissioners of the City of Washington records, 1791-1869, on 1 microfilm reel; in Robert R. Hunter papers, 1822-1887; and Nicholas Philip Trist papers, 1795-1873. Papers: 1807-1882. 1 box. Also ca. 125 letters and papers in various collections. Papers: 1 item (1862). Bill for board; and a portrait. Papers: Correspondence in Canfield-Dickerson families papers, 1738-1920; and Kinney family papers, 1783-1900. Papers: 1806-1860. Ca. 100 items. Miscellaneous papers. Additional Papers: Correspondence in Donald F. Clark collection, 1642-1920; and Charles Edward Dudley papers, 1805-1851. Papers: In George Bancroft papers, 1823-1890; and James A. Hamilton papers, [ca. 1740-1867]. Papers: Official correspondence with Governor Van Buren in Reuben Hyde Walworth papers, 1827-1866; and 2 letters in miscellaneous manuscripts collection. Papers: 1805-1866. Ca. 200 items. Correspondence (1811-1861), legal briefs, receipts, summons, autograph notes, and draft of speech. Also 4 letters in Albert H. Allen Tracy correspondence, 1815-1851. Papers: 12 items. From vice-presidential and presidential years. Papers: 1803-1840. 14 items. Includes 10 letters (1803-1816) to William P. Van Ness concerning politics and business. Papers: Correspondence in Marvin Henry Bovee papers, 1850-1884, on 1 microfilm reel. Papers: Ca. 30 items (1834-1836) in various collections. Finding aid. Papers: 35 microfilm reels of originals (1787-1862) in Library of Congress; items in Van Buren miscellaneous family papers, 1809-1859; and a bust. Papers: 5 letters and numerous items in various collections including correspondence with William Henry Roane in the Harrison family papers, 1756-1893. Papers: 35 microfilm reels of originals (1703-1862) at Library of Congress; 1 microfilm reel of correspondence and manuscripts, 1813-1860; 1 microfilm reel of papers of originals (1808-1835) at New York Historical Society; and correspondence in Joseph Wheaton papers, 1797-1839; William Smith Mason collection, 1800-1929; Anson Conger Goodyear collection, 1813-1890; and Alfred White Van Sinderen collection, 1782-1969. Papers: 11 items (1829-1842) in Moses Dawson collection of political letters of the Jackson period, 1811-1845. Research Libraries Information Network In addition to the institutions listed above, items are also cataloged in collections at: Alabama Department of Archives and History, Montgomery, AL; American Philosophical Society, Philadelphia, PA; Brown University, Providence, RI; Buffalo and Erie County Public Library, Buffalo, NY; Chautauqua County Historical Society, Westfield, NY; Cornell University Libraries, Ithaca, NY; Dutchess County Historical Society, Poughkeepsie, NY; Franklin D. Roosevelt Library, Hyde Park, NY; Fraunces Tavern Museum, New York, NY; Hagley Museum and Library, Greenville, DE; Mills Mansion State Historic Site, Staatsburg, NY; New York City Municipal Archives, New York, NY; New York University Archives, New York, NY; New York Society Library, New York, NY; New York State Archives, Albany, NY; Northwestern University Library, Evanston, IL; St. Lawrence County Historical Association, Canton, NY; Stanford University Libraries, Stanford, CA; State University of New York, Buffalo, NY; State University of New York at Plattsburgh, Special Collections, Plattsburgh, NY; Syracuse University, George Arents Research Library, Syracuse, NY; Temple University Libraries, Philadelphia, PA; University of Rochester, Rush Rhees Library, Rochester, NY; Washingtons Headquarters State Historic Site, Newburgh, NY.